If a title you borrowed has holds, you won't be able to renew it. Instead, you can use the Request again feature to join the title's wait list, so you can borrow it again once it's available. You'll see the Request again option on your Loans page (under ) three days before the title expires. Select the Request again button under the title you'd like to request. If prompted, enter and confirm your email address in the pop-up window. 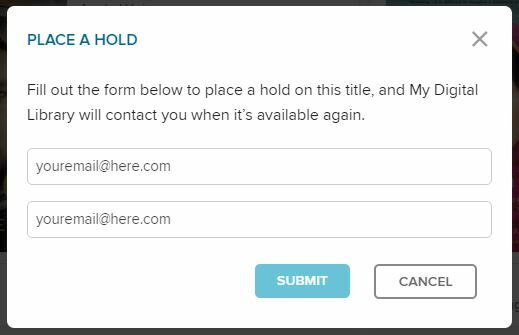 Titles that you've requested again will appear on your Holds page and will be automatically checked out to you once they're available again (unless you've turned off automatic hold checkout). If a title that you've borrowed has holds, you won't be able to renew it. Instead, you can use the Request Again feature to join the title's holds list, so that you can borrow it again once it's available. 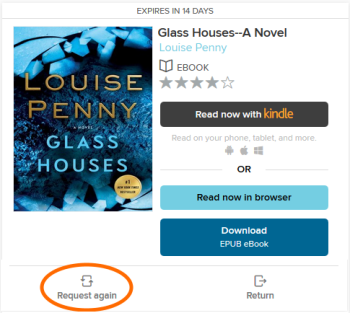 The Request Again option becomes available three days before the title expires and appears next to the title on your Checkouts page (under your Account). Note: Some libraries may not offer the Request Again or Renew features. Enter and confirm your email address in the hold form, then select Place a Hold. If you want the title to be automatically added to your Checkouts page as soon as it's available (instead of being held for you on your Holds page), make sure that "Automatically borrow this title when it becomes available" is selected. 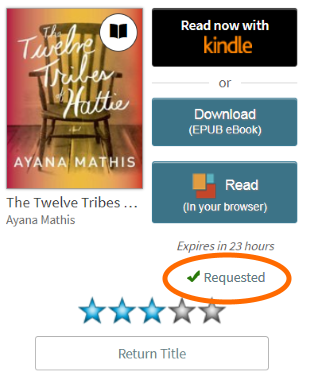 Once you request a title again, you will see a checkmark and the word Requested next to that title on your Checkouts page. You can also see which titles you've requested on your Holds page. Once the title is available, you'll receive an email with instructions on how to access it again. You'll either be instructed to find the title on your Checkouts page (if you had the title automatically borrowed for you) or borrow the title from your Holds page.